Have you noticed the change in terminology in the last couple of years...when it was proven that the earth had been cooling for close to a decade? Instead of "global warming" they instituted, "climate change"...how very inclusive of them! Anyway, something "weird" is happening but it's not about how much breathing us humans are doing, I promise you. It may be something far more cosmic. If you are wondering what I mean, I would suggest you pick up a New Testament and read Matthew 24 as a starter. -W.E. From highways in Texas to nuclear power plants in Illinois, the concrete, steel and sophisticated engineering that undergird the nation’s infrastructure are being taxed to worrisome degrees by heat, drought and vicious storms. On a single day this month here, a US Airways regional jet became stuck in asphalt that had softened in 100-degree temperatures, and a subway train derailed after the heat stretched the track so far that it kinked — inserting a sharp angle into a stretch that was supposed to be straight. In East Texas, heat and drought have had a startling effect on the clay-rich soils under highways, which “just shrink like crazy,” leading to “horrendous cracking,” said Tom Scullion, senior research engineer with the Texas Transportation Institute at Texas A&M University. 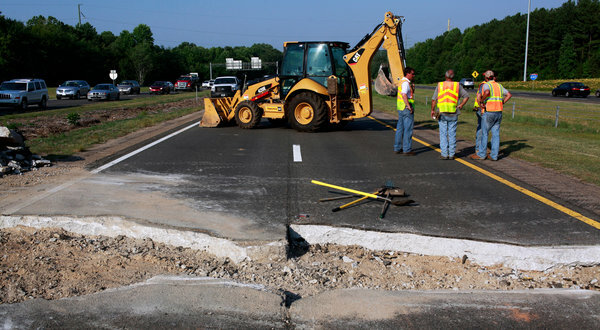 In Northeastern and Midwestern states, he said, unusually high heat is causing highway sections to expand beyond their design limits, press against each other and “pop up,” creating jarring and even hazardous speed bumps. Excessive warmth and dryness are threatening other parts of the grid as well. In the Chicago area, a twin-unit nuclear plant had to get special permission to keep operating this month because the pond it uses for cooling water rose to 102 degrees; its license to operate allows it to go only to 100. According to the Midwest Independent System Operator, the grid operator for the region, a different power plant had had to shut because the body of water from which it draws its cooling water had dropped so low that the intake pipe became high and dry; another had to cut back generation because cooling water was too warm. The frequency of extreme weather is up over the past few years, and people who deal with infrastructure expect that to continue. Leading climate models suggest that weather-sensitive parts of the infrastructure will be seeing many more extreme episodes, along with shifts in weather patterns and rising maximum (and minimum) temperatures. “We’ve got the ‘storm of the century’ every year now,” said Bill Gausman, a senior vice president and a 38-year veteran at the Potomac Electric Power Company, which took eight days to recover from the June 29 “derecho” storm that raced from the Midwest to the Eastern Seaboard and knocked out power for 4.3 million people in 10 states and the District of Columbia. In general, nobody in charge of anything made of steel and concrete can plan based on past trends, said Vicki Arroyo, who heads the Georgetown Climate Center at Georgetown University Law Center in Washington, a clearinghouse on climate-change adaptation strategies. Adaptation efforts are taking place nationwide. Some are as huge as the multibillion-dollar effort to increase the height of levees and flood walls in New Orleans because of projections of rising sea levels and stronger storms to come; others as mundane as resizing drainage culverts in Vermont, where Hurricane Irene damaged about 2,000 culverts. “They just got blown out,” said Sue Minter, the Irene recovery officer for the state. In Washington, the subway system, which opened in 1976, has revised its operating procedures. Authorities will now watch the rail temperature and order trains to slow down if it gets too hot. When railroads install tracks in cold weather, they heat the metal to a “neutral” temperature so it reaches a moderate length, and will withstand the shrinkage and growth typical for that climate. But if the heat historically seen in the South becomes normal farther north, the rails will be too long for that weather, and will have an increased tendency to kink. So railroad officials say they will begin to undertake much more frequent inspection. Some utilities are re-examining long-held views on the economics of protecting against the weather. Pepco, the utility serving the area around Washington, has repeatedly studied the idea of burying more power lines, and the company and its regulators have always decided that the cost outweighed the benefit. But the company has had five storms in the last two and a half years for which recovery took at least five days, and after the derecho last month, the consensus has changed. Both the District of Columbia and Montgomery County, Md., have held hearings to discuss the option — though in the District alone, the cost would be $1.1 billion to $5.8 billion, depending on how many of the power lines were put underground. Even as the effects of weather extremes become more evident, precisely how to react is still largely an open question, said David Behar, the climate program director for the San Francisco Public Utilities Commission. “We’re living in an era of assessment, not yet in an area of adaptation,” he said. He says that violent storms and forest fires can be expected to affect water quality and water use: runoff from major storms and falling ash could temporarily shut down reservoirs. Deciding how to address such issues is the work of groups like the Water Utility Climate Alliance, of which he is a member. “In some ways, the science is still catching up with the need of water managers for high-quality projection,” he said. Some needs are already known. San Francisco will spend as much as $40 million to modify discharge pipes for treated wastewater to prevent bay water from flowing back into the system. Even when state and local officials know what they want to do, they say they do not always get the cooperation they would like from the federal government. Many agencies have officially expressed a commitment to plan for climate change, but sometimes the results on the ground can be frustrating, said Ms. Minter of Vermont. For instance, she said, Vermont officials want to replace the old culverts with bigger ones. “We think it’s an opportunity to build back in a more robust way,” she said. But the Federal Emergency Management Agency wants to reuse the old culverts that washed out, or replace them with similar ones, she said. Matthew L. Wald reported from Washington, and John Schwartz from New York.